"How to Cut Your Bridal Alterations Costs"
This is what fashion experts say, and it is so true when it comes to wedding gowns. Bridal alterations made on your wedding dress is the only way to have it fit properly and be comfortable to wear. First, you must choose the right bridal gown. To keep your wedding dress alterations costs to a minimum . . . you must choose, find and buy your perfect wedding dress. And second, you must choose the right sewing professional to work on your dress. You need a knowledgeable wedding dress alteration specialist or a wedding dressmaker to work on your gown. "Cut Costs by Choosing the Right Wedding Dress"
The first step to keeping your bridal alterations costs to a minimum starts with choosing a wedding dress that compliments your figure. "A wedding dress style that works with your body shape and not against it will need fewer alterations." Also, remember this fact... "the details in the gown add to the costs of wedding dress alterations." Some bridal dresses because of the way the details are applied on the gown can be very expensive to alter. 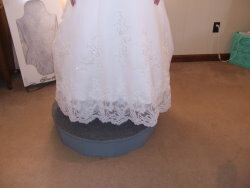 The most popular alterations needed for a wedding gown are usually the sides need taken in and the hem shortened. If there are details in these areas--- it will cost you more to alter than a dress without details in these areas. Lace hems like this is very expensive to alter. In some rare designs you can't for instance, bring up the embroidery detail on the skirt hem without it being cut off altogether and re-sewn back on. Sometimes you have to take the stitching out and bring it up, which takes a lot of time and is very costly. Multi-layer gowns like tulle wedding dresses, are expensive to hem, because you have to line up the layers and cut them so that they fall as evenly as possible. Or you have to hem it from the waistline. So I would advise you that when trying on dresses . 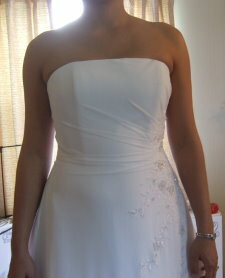 . . ask the bridal shop seamstress how much the bridal alterations will cost for specific styles. This may help you decide to choose one gown over another, especially if you are on a strict budget.. When wedding dress shopping... take notice of the quality of the bridal fabrics used. Better quality fabrics don't wrinkle easily. Pay attention to the inner linings of the gown. They should be of a good quality and feel comfortable up against the skin. This dress has an inner bustier. 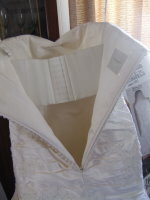 The inner structure of a well made wedding dress can cut your bridal alterations costs. You especially need a lot of inner structure for strapless wedding dresses in order to maintain it's shape which helps the gown stay up on you. Do you see a lot of boning in most of the seams of the gown? The more the better. In fact, the better quality wedding gown designers also include an inner built-in bustier and attached slip for support and comfort. This could save you the cost of buying a bra and a slip. Low end, poorly made wedding gowns usually don't fit well, because the dress lacks structure underneath the outer layers. This will make your bridal alterations cost more if boning has to be added. Here is a elastic bustier. On better made dresses... the outer fabric will be underlined. In some cases, the lining will be underlined also. Boning will be in all seams as well as between seams. There will be built in bra cups sew in the bust area to give shaping. Bridal dresses that aren't strapless will not need much boning, if any. Wedding gowns that are supported by your neck, such as a halter style; or your shoulders in the case of a sleeveless or sleeved dress, will not need as much support and underlining. If you are a bride that is in 'tip top shape' . . . you can wear a gown with less structure. "You probably have the type of body that you could wear a slip dress and it will look good on you." But if you feel you are not in the best of shape and need a little or a lot of help, "then don't buy a low end bridal gown lacking structure." Yes-- you can help a dress fit better by wearing the right body shaping garments underneath. Still the average wedding dress needs some structure to it also. This will cut down on the wrinkles that can appear in the bodice while wearing it. Dresses used for beach weddings and other informal wedding dress styles usually will not have as much structure. These informal styles are made out of light fabrics and don't need as much underlining and boning structure because of the styles used. But they still need to be well made and out of good quality fabrics in order for you to look good and feel comfortable. When it comes to bridal alterations just remember . . . some bargain wedding dresses can end up costing you on the back end. How? "You could end up paying more to have it altered, restructured and for additional shaping garments, then what you paid for your gown. I see this happen a lot with the replica gowns you can get offshore for $200 - $300! Don't let this happen to you!" When shopping for your wedding dress find out how to tell the difference in a well made wedding gown from one of inferior quality. Get more value for your money! Click on the link for Desiree's Custom Sewing.